Want to make a ninja mage in Skyrim? Then go ahead! 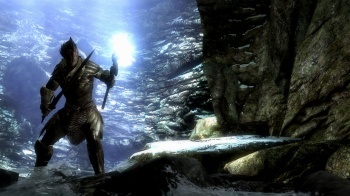 A dedicated Skyrim fan has posted a rough and ready guide to the game's various racial traits and skill perks which he recorded at the recent Eurogamer Expo. The fan, who goes by "Sammuthegreat" on the Bethesda forums, managed to make fairly detailed notes on 12 of the game's 18 skills, as well as all of the races. The list isn't exhaustive however, as Sammu wasn't able to note down every perk for every skill, or whether some of them have ranks or not. It's also worth mentioning that Sammu made this list in a hurry, so there may be some mistakes. All the same, just looking at it shows that there's plenty of scope for character customization, even with the reduced number of skills. As you can see from the list, a lot of racial traits, like Voice of the Emperor or Adrenaline Rush, return from previous Elder Scrolls games. Others, likes Histskin and Battle Cry are new, and others have been tweaked, like the Argonian's resistance to diseases, which has seemingly gone down from 75% to 50%. Sammu also noted that different races get different bonuses to skills. - Novice for 50% less magicka, etc. As I said, the list isn't complete, as there are both perks and skills missing from it, but - if nothing else - you can get a sense of what's in store in the game. Of course, as there's a while to go before Skyrim comes out, a lot of these details could change.